A Golden Hamster is a wonderful little pet for children of all ages and can give hours of fun and pleasure for their carer. 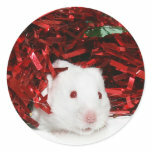 There are several other Hamsters that share the same breed characteristics as the Golden Hamster. Namely, the Syrian Hamster, the Teddy Bear Hamster and the Common Hamster. However, it is absolutely essential to look after and give your Golden Hamster the very best care you can. When deciding to have a Golden Hamster as a pet you must be committed to giving them lots of attention, first class care and lots of love. They will repay you with being the most charming little fellows imaginable. What type of Hamster do you have.? Is it a Golden Hamster, a Syrian Hamster or a Teddy Bear Hamster.. 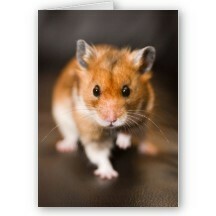 Sadly, I haven't got a hamster to look after, but I'd love one. The actual name - Golden Hamster - isn't actually, quite true as they can be found in many different colours, although predominately golden you will find them having coats of many colours, like a creamy shade, white, black, a light blonde shade and they are even found with a tortoiseshell coat. How to ensure you give good Golden Hamster care. These little fellows are very active, but mainly during the night. So if you intend to have them for your children and they want to keep them in their bedrooms, be prepared for the children to hear them sniffling about while their trying to sleep. They normally wake up around sunset and will be hungry, ready to eat and play for long periods during the night. So it is essential they have a full bowl of food, clean fresh water and lots of things to keep them amused. One important thing to remember is that some hamsters are generally solitary, but if you are planning on keeping more than one hamster in a cage together you must get yourself a Hamster reference book about that breed to see if you can keep more than one together. Generally, it is not a good idea to keep more than one in a cage. There is a very good chance they will fight and the fights will be quite vicious. As your Golden Hamster will generally prefer their own company it is even more important that they have lots of toys and activities to keep them busy. They are happy to build little houses and dens and run around from one to another keeping them all tidy and ship shape. So a good supply of quality bedding for them to use when they start their building work - and believe me, they will love building new little homes and dens within their cage habitat. Quality bedding is another essential item to put on your list. 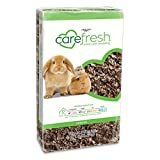 I recommend the 'Carefresh' range of Hamster bedding. This is a bio degradable hamster bedding and one I prefer. It will absorb any odour very well. In order to ensure your Golden Hamster is in good health you must pay attention to their diet. Always buy good quality hamster food from a recognised pet food outlet and try to get the best you can afford. 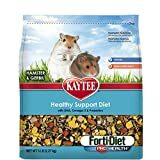 Quality Hamster food will have all the required nutrients specifically for Hamsters right there in one packet. 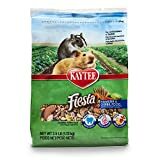 A loose seed mix must be of a high quality to ensure there is a varied amount of seeds that will provide all the different nutrients for your Hamster. But beware, if your Hamster is a bit fussy, you might be left with a lot of just one or two type of seeds if there not to your Golden Hamsters liking..! Pellet food is more than acceptable for your Hamster but it's quite boring, like eating fish n chips every day for us humans! Generally I would recommend using the Pellet Type Feed feed over the Loose Seed Mixture but, in order to combat any eating bordom, I add a variety of different seeds and just sprinkle them over the pellets. Human food goes down quite well with Hamsters as well. But only Healthy Human Foods not junk food... Not more than 20% of the main food, add some coarsely chopped fresh vegetables and nice fresh fruit. Your Golden Hamster Must Not Have Sugary Treats. It wont take long before you get to know exactly what your Hamster likes to eat, but don't be afraid of trying new foods, they surprise you sometimes! The choice of Hamster Homes is huge and can be both fun for the little fellow and give hours of enjoyment, as well as being his home where he will feel safe and loved. 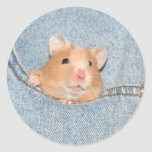 There are literally hundreds to choose from, so I have a separate page devoted just to Hamsters Cages and Hamster Homes - with all the information you want to select the right one. Leave little "treats" hidden around the cage for him to sniff out and find, even dangle them up high - he will work out a way to get them.! 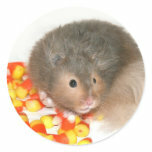 Now you have read all about Golden Hamster Care - Would you have a Hamster as a pet.? My youngest daughter loves hamsters, she hasn't had a golden hamster but will be keeping this in mind when we pick a new pet.